1 Rectangular Table 59Lx36Wx29H 4 Armchairs 22Wx23Dx37H. Seat Dimensions:18Wx18Dx18H. The Amazonia Collection is committed to providing premium quality sets with an elegant design that will make your home stand out above the rest. Crafted from solid Eucalyptus Grandis"wood, grown in 100% managed forests in Brazil and certified by the FSC (Forest Stewardship Council), this eucalyptus furniture is known for its longevity and craftsmanship at an affordable price. Enjoy your patio in style with these great sets from our Amazonia Collection. 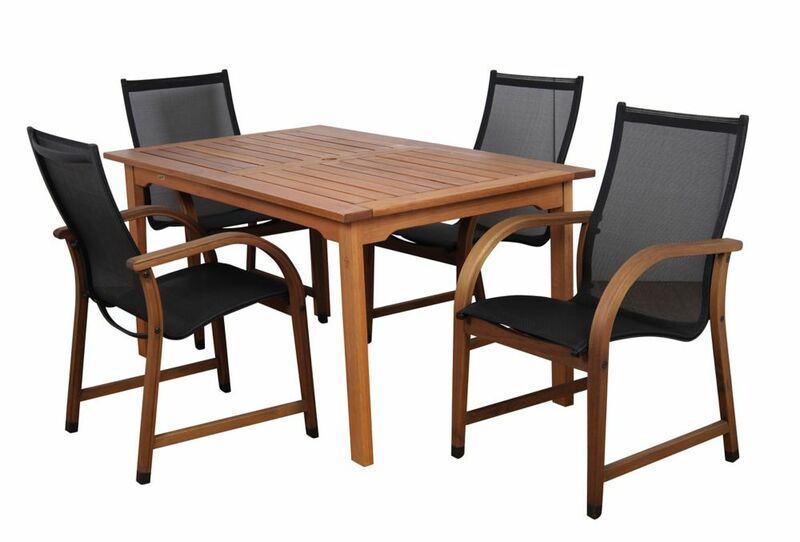 The Amazonia Teak sophisticated line combines quality, style, and comfort. Crafted of high quality teak (Tectona Grandis), this modern furniture collection will make an immediate impact in your patio. To create an ideal outdoor living space, a dining set is a necessity. It is a key element to enjoy meals or games with family and guests. Never again worry about surprise barbecues or outdoor events with multiple guests. Poolside or on the patio, this dining set is ideal for weekend brunches or relaxing outdoors with a glass of refreshing lemonade.7PC Dining Set Aluminum Frame makes this set sturdy and durable. Table Size: 59 x 35.4 x 28 5mm Marble Printed Tempered Glass Chair With Text Ilene 2 x 2 Sling Size: 22.4 x 22 x 36 With dark grey frame and text Ilene. The dining set offers a seating capacity for six people. It can be used to suit contemporary inspired decor settings with great style. Bahamas Eucalyptus Wood 5-Piece Rectangular Patio Dining Set The Amazonia Collection is committed to providing premium quality sets with an elegant design that will make your home stand out above the rest. Crafted from solid Eucalyptus Grandis wood, grown in 100% managed forests in Brazil and certified by the FSC (Forest Stewardship Council), this eucalyptus furniture is known for its longevity and craftsmanship at an affordable price. Enjoy your patio in style with these great sets from our Amazonia Collection. Bahamas Eucalyptus Wood 5-Piece Rectangular Patio Dining Set is rated 5.0 out of 5 by 1.